Had request to uninstall teams as they had deployed the teams to users who not supposed to get it on their windows devices. Microsoft Teams brings together the full breadth and depth of Office 365, to provide a true chat-based hub for teamwork and give customers the opportunity to create a more open, fluid, and digital environment. Microsoft Teams is built on existing Microsoft technologies woven together by Office 365 Groups. In this post ,we will see how to uninstall teams client using ConfigMgr by creating application or package and deploy to either users or computers . we can download Teams client 32bit or 64bit MSI and deploy to users or computers . When you deploy teams application ,it will be installed in that user's appdata folder. Using command line ,we can create package or edit the teams application and edit the deployment type, add the uninstall program . This command like simply uninstall the teams client but it wont cleanup the folder . There is 2nd method that we can use to uninstall teams client using powershell script. Create a powershell script and deploy the script to collection . When you deploy the script ,make sure it runs with user account and also only when user logged in. 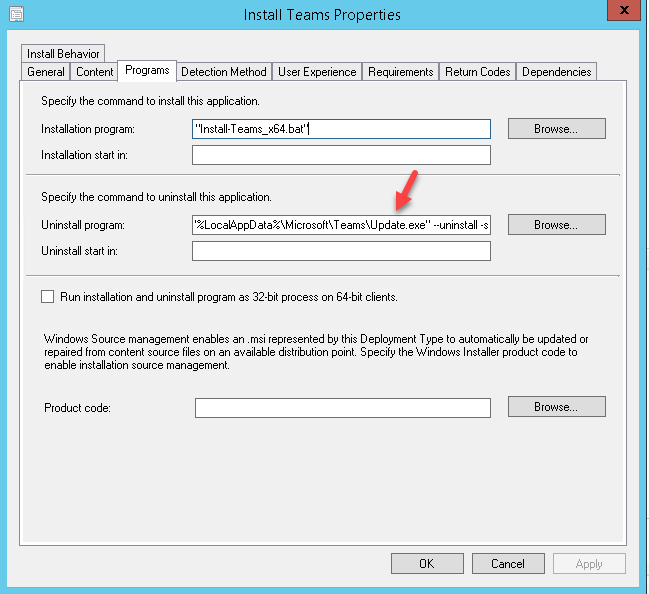 since the teams client is installed in Appdata folder ,uninstall must run only when user logged in . 2 Responses to "How to uninstall teams client using SCCM Configmgr"
I would like Install Teams and need to diable Autostartup and while deploying I am getting error, It seems Detection not working properly. Request to provide me the installation details also.